The Constitution is the supreme law of the country. Here the word ‘Constitution’ is used to refer to a special document having a special legal sanctity in which some of the more important constitutional rules, values and goals are set out. A Constitution must not be too rigid or too flexible in regard to Amendments. This Constitution was granted by the British following the recommendations of the Commission on Constitutional Reform established in 1945 under the Chairmanship of Lord Soulbury for the purpose of the country to become an independent ‘dominion’ within the British Commonwealth. It was given effect to by the Ceylon Order in Council of 1946 read together with the Ceylon Independence Act of 1947 and came into force on February 4, 1948. By Amendment No.36 of 1971 to the Soulbury Constitution of 1946, the Senate was abolished on October 2, 1971, prior to the adoption of the new republican Constitution of Sri Lanka on May 22, 1972. The United Front, an alliance consisting of the Sri Lanka Freedom Party and the leftist parties that came to power at the May 1970 election introduced a Parliamentary Bill to abolish the Senate. The Bill’s second reading was passed by the House of Representatives on May 21, 1971. The Senate met for the last time on September 28, 1971. The Ceylon (Constitution and Independence) Amendment Act No.36 of 1971 received Royal Assent on October 2, 1971, becoming an Amendment to the Soulbury Constitution. The Senate was abolished after nearly 24 years of existence. This Constitution (save for section 29) was to a large extent a codified model of Britain’s ‘unwritten’ Constitution. However, being codified, it could not be altered or amended without a two-thirds majority of the total membership of the House voting in favour (Section 29(4)). However, judicial interpretation of section 29 had unexpected consequences. Section 29(1) empowered Parliament to make laws for the ‘peace, order and good government’ of the island. Section 29 (2) rendered void any law or any part of a law that sought to restrict the free exercise of any religion or subject persons of any community or religion to disabilities or restrictions not imposed on other communities or religions. Section 29(3) declared that any law made in contravention of sub section (2) would be void to the extent of such contravention. Section 29(4) declared that no Bill for the amendment or repeal of the Constitution shall be presented for Royal Assent (the Sovereign being represented by the Governor - General) unless it bore the Speaker’s certificate to the effect that it had been passed by Parliament by a two-thirds majority vote. Certain doubts and ambiguities persisted with regard to the issue of the competence of the Sri Lankan Parliament to amend section 29(2) of the Soulbury Constitution, which the Privy Council interpreted in Ranasinghe’s case as containing an absolute limitation rendering it completely unalterable. In this case of Bribery Commissioner v Ranasinghe the actual dispute was whether an amendment to the Bribery Act creating a special Bribery Tribunal had been passed with the required two-thirds majority in terms of Section 29(4) in view of the fact that it was in conflict with the provisions of Section 55 of the Constitution dealing with judicial power. However, in the course of reviewing the provisions of Section 29, the Judicial Committee of Privy Council hearing the case stated that section 29(2) set out ‘entrenched religious and racial matters which shall not be the subject of legislation’. These matters in the view of the Judicial Committee represented ‘the solemn balance of rights between the citizens of Ceylon, the fundamental conditions on which inter se, they accepted the Constitution and these are therefore unalterable under the Constitution’. 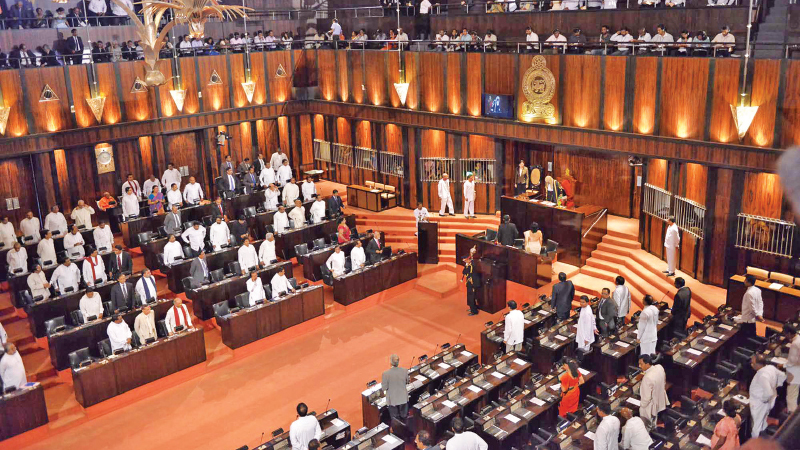 Deriving its authority directly from the sovereign will of the people of Sri Lanka, the Constituent Assembly process was invoked in 1970 to frame a new Constitution by the new Government. The elected members of the House of Representatives who were the ‘founding fathers’ met as duly authorized representatives of the people at a Constituent Assembly to establish a new Constitution. This procedure was adopted in order to establish the autochthony of the Constitution or to cause a break in legal continuity with the previous legal order rooted in Britain. Two fundamental features underscore the transition from a Dominion to a Republican Constitution, namely, the principle of autochthony and the doctrine of the supremacy of Parliament. Ironically, after Sri Lanka enacted the 1972 Constitution to become a Republic, the UK Parliament enacted the Sri Lanka Republic Act 1972 to make provision for Ceylon to become a Republic within the Commonwealth under the name of Sri Lanka. The 1972 Constitution proclaimed Sri Lanka to be a ‘Free, Sovereign and Independent Republic’, and also to be a unitary State. In place of Article 29(2) of the Soulbury Constitution, the 1972 Constitution guaranteed equality to all citizens and dealt with religion in Article 6 of the 1972 Constitution. Although the 1972 Constitution expressly acknowledged the concept of sovereign power of the people, it did not contain provisions which made that concept justiciable. Apart from this, while the Constitution provided for a separate chapter enshrining fundamental rights and freedoms, there was no specific machinery to challenge any executive or administrative action which might have been violative of those rights and freedoms. Furthermore, the Constitution expressly precluded judicial review of enacted legislation, but permitted pre-enactment judicial review of legislation. This stood in contrast to the position under the Soulbury Constitution under which as interpreted by the Courts it was possible to challenge any legislation enacted by Parliament after its enactment. Under the 1972 Constitution, the power to repeal or amend the Constitution was vested exclusively in the National State Assembly. The special majority required for Constitutional amendment was two-thirds at least of the whole House (including those absent) voting affirmatively in favour of passing the provisions. (Article 51(5)). No referendum was required but in the event of repeal of the Constitution a new Constitution had to be enacted to replace the one that was being repealed. Suspension of the Constitution was prohibited but the National State Assembly could by a two-thirds majority pass a law that was inconsistent with the Constitution. Compared to the 1972 Constitution, the provisions of the 1978 Constitution relating to Constitutional Amendments are different due to certain provisions being entrenched. A procedure was also introduced under the 1972 Constitution for challenging Parliamentary Bill before a special Constitutional Court set up under Article 54 (1) of that Constitution whose jurisdiction could be invoked by any citizen. However, this right could be suspended in the case of a Bill certified as ‘urgent’. The provisions of these last two paragraphs were reproduced with some variations in the 1978 Constitution. Under the 1978 Constitution the Supreme Court was substituted as the highest Court of the land for the Constitutional Court under the 1972 Constitution. The Constitutional Court set up under the 1972 Constitution in its ruling on the Local Authorities (Imposition of Civic Disabilities) No.2 Bill rejected the argument that there were certain provisions in the Constitution which were fundamental to it which could not be changed or amended or repealed even with a two-thirds majority. One of the significant orders of the Constitutional Court was in relation to the Excise Amendment Bill which it held conflicted with the Constitution – one of the few Bills which the Constitutional Court had held to be contrary to the 1972 Constitution. The Court noted that the Bill on the face of it sought to vest an unfettered discretionary power in the Minister without assigning any reason to direct any authority granting licence to grant a licence, to renew or cancel a licence and to compel such authority to give effect to discretion. Accordingly the Constitutional Court held that the Bill was inconsistent with Section 18(1) (a) of the 1972 Constitution. Once the Court has held that a Bill conflicts with a provision of the Constitution it could be enacted, if a two – thirds majority of the entire membership of the National State Assembly vote in favour of it. Following the General election in 1977 the United Front government that had introduced the 1972 Constitution was defeated and the United National Party came to power with a 5/6th majority of the seats in Parliament. Initially the new government sought to amend the 1972 Constitution in a sweeping manner so as to convert what was still essentially a Westminster model of government into an executive Presidential system. The change was effected under the terms of the 1972 Constitution. The two factors that influenced the former President Jayewardene’s long standing advocacy of a presidential system for Sri Lanka as stated by him were a search for executive stability and an anxiety to create and maintain consensus of politics. The Second Amendment Bill was rushed to the Constitutional Court seeking an opinion and by the debate in the National State Assembly was taken up only two weeks later. The Bill was certified on October 20, 1977, but was brought into operation only on February 4, 1978 for the new President to take office on Independence Day. Mr. Jayewardene had been appointed as the Prime Minister on July 23, 1977 and would have been entitled to continue in that office for six years from that date. The Second Amendment provided for the incumbent Prime Minister to become Executive President and to be in office for six years from the date on which he assumed the Presidency, which would be until February 4, 1984. The 2nd Amendment, albeit brief in its content, sliced through the Constitution of 1972 and, by virtue of Section 19 and the Amendments to Section 20, the President became the Head of State, the Head of the Executive, the Head of Government and Commander -in -Chief of the armed forces and was empowered to declare war and peace. (c). the executive power of the People, including the defence of Sri Lanka, shall be exercised by the President." By virtue of Section 28B of the Second Amendment to the Constitution of 1972 the then Prime Minister J. R. Jayewardene was deemed for all purposes to have been elected President of Sri Lanka. The Second Amendment to the 1972 Constitution was passed on October 4 within two months of the General Election of 1977 establishing the office of the Executive Presidency. The Second Amendment amended section 94 of the 1972 Constitution to remove the Prime Minister’s power to determine the number of Ministers and assignment of their subjects and functions to vest these powers in the President who could in addition take charge of any subjects not assigned and any ministry to which a minister is not appointed. This vital amendment was debated in the Assembly for a short time with the Opposition boycotting the deliberations. At the time of introducing the 2nd Amendment, Prime Minister Jayewardene clarified other changes to be considered by a Select Committee which would also seek the views of political parties not represented in the Assembly. Accordingly a Select Committee was convened in November in 1977 to consider and draft further revisions to the Constitution. The new document was adopted by the National State Assembly in August in 1978 and inaugurated on September 7, 1978. In 1978 the Second Republic Constitution was enacted under section 51 of the 1972 Constitution. Therefore the present Constitution draws its validity from the 1972 Constitution, which in turn was brought into operation by the Constituent Assembly established through a people’s mandate. ‘The executive power of the People, including the defence of Sri Lanka shall be exercised by the President of the Republic elected by the People’. The words ‘elected by the People’ are the only words added to the original formulation in Section 5(c) of the Second Amendment to the Constitution of 1972. These words are significant and add an extra dimension to the executive power including the defence of Sri Lanka which is reposed in and exercised by the President, through the mandate directly received from the People in the exercise of their franchise at the election of the President. This is distinct from the mandate received by Members of Parliament who exercised the legislative power of the People in terms of Article 4(a). From the preceding brief account of post-Independence constitutional history of the country, it is clear that under the Independence and 1972 Constitutions, the executive power including the defence of Sri Lanka was exercised by the Cabinet of Ministers by the Prime Minister. By the Second Amendment to the Constitution of 1972, the reference to the Cabinet of Ministers in Section 5, which dealt with the exercise of executive power and the defence of Sri Lanka was removed. That removal of the characterization of the Cabinet of Ministers as the repository of Executive power including the defence of Sri Lanka was further entrenched by Article 4(b) of the present Constitution of 1978 which links the exercise of such power to the mandate received by the President from the People who are sovereign. (The writer is Retired Professor in Law in the University of Sri Jayewardenepura. He is an Attorney-at-Law with Ph.D. in Law as well).